We often find that the chest and neck are left out of the daily skin care regimen which means they are ageing at a much faster rate than the face. The neck is prone to develop signs of ageing and can lose its firmness over time. To help reduce these signs, Striagen-N uses set of carefully-selected ingredients known for their abilities to help tighten, firm and rejuvenate the skin.This is an alternative to cosmetic surgery and can be used in the comfort of your home. There are ingredients that have been used in various skin care products for their qualities of penetrating deep into the dermal layers of skin, helping to promote natural, healthy skin growth and cell regeneration. By using similar ingredients in this formula, Striagen-N Cream offers you a chance to help firm the skin around your neck, aiming to take care of your skin and regain your youthful look. Signs of ageing can be characterised by the changes in facial appearance such as wrinkles, fine lines and loose skin. The neck is believed to be the first place that starts showing signs of ageing due to the fewer natural skin protectors. 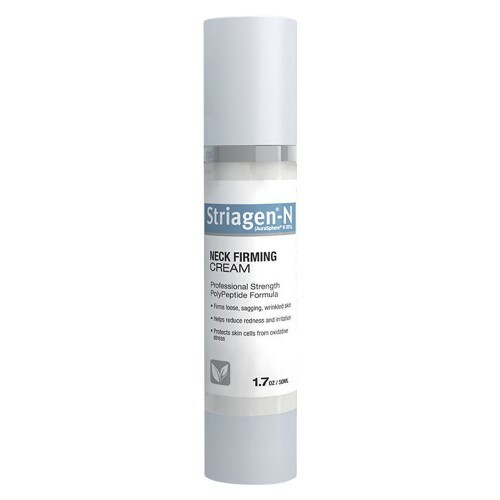 Striagen-N Neck Firming Cream offers a natural way to help tighten the skin around your neck, thanks to the advanced ingredients and natural extracts such as Aloe Vera and Cucumber. Striagen-N uses a unique blend of ingredients that are known to help reduce the appearance of ageing around the neck area. Advanced Aurasphere: This ingredient is well-known for its properties to reduce the appearance of sagging and wrinkled skin around the neck area. TensUp: By speeding up the production of collagen and providing elasticity to skin, this ingredient assists the procedure of lifting and tightening the skin. Pronalen: Designed to help minimise the appearance of sagging skin, whilst promoting a tightening effect on the skin. Hyaluronic acid: Although produced naturally in the body, maintaining the level of this ingredient can help to strengthen collagen and improve skin elasticity. Aloe Vera juice: Known for its natural antiseptic and anti-inflammatory properties, Aloe Vera is a beneficial ingredient that may help reduce inflammation and pain. Cucumber extract: Containing natural cleanser and moisturising properties, Cucumber extract includes vitamins A,C and E, essential antioxidants and amino acids, which can help soothe the skin. Apply a generous amount of the cream to your neck and upper chest area and gently massage. Using an up and down motion, apply the cream over the entire collar area. You can follow by applying the cream sideways across the throat and below the chin, focusing on the lower neck area. We recommend you do this twice a day and ensure you avoid contact with eyes.